Better Restaurant Stock Buy: Chipotle Mexican Grill, Inc. or Buffalo Wild Wings? Neither stock is cheap. But investors looking for strong profit growth should consider these two hit restaurant concepts. Whether it's through chicken wings delivered by a server, or tacos assembled cafeteria-style, the financial results have been the same for long-term investors. 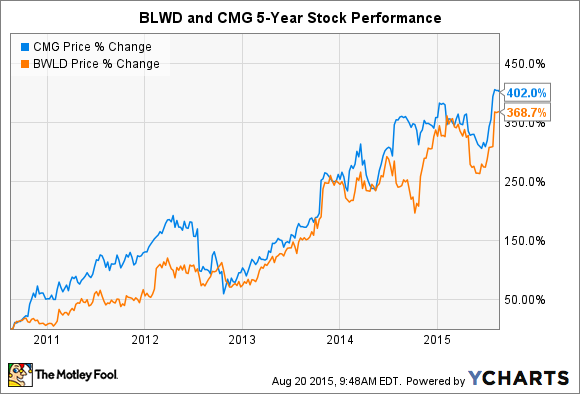 Both Chipotle (NYSE:CMG) and Buffalo Wild Wings (NASDAQ:BWLD) shares are up about 400% over the last five years. It's not hard to see why Wall Street is so optimistic about these businesses. Each company's sales grew nearly 20% through the first half of this year. And customer traffic levels have climbed to the point that B-Dubs and Chipotle executives have both felt confident enough to raise menu prices on everything from steak burritos to boneless wings. If their pricing power holds, the result should be more market share gains — along with supercharged revenue and profit growth. Annual revenue is based on the last complete fiscal year. Profit and sales growth are 2015 expected. Profit margin, P/E, and P/S ratios are over the trailing twelve months. Source: Company financial filings. Chipotle posted an incredible 36% jump in earnings in the first half of 2015 as net income rocketed to $263 million from $193 million in the prior-year period. Yet what's most impressive about that growth is that it came despite some major profit headwinds. A pork shortage has kept carnitas off Chipotle's menu in at least one-third of its restaurants, lowering sales growth by about 2 percentage points over the last few months. At the same time, management has held off on raising menu prices for beef options at 40% of its locations. "We want to avoid the unintended consequence of having customers trade from carnitas to steak or barbacoa and then be forced to pay more for their meal," an executive explained during last quarter's conference call. But the carnitas shortage is ending and pork will be available at all Chipotle locations by the end of the year. That should help the company get back into record customer traffic territory, and it will free up management to raise its beef prices in line with the spiking cost of the ingredient. All of that points to hefty profit growth in 2015: Wall Street sees Chipotle earning $17.36 per share this year, up from $14.13 per share in 2014. Beer prices start creeping up at BWLD beginning in August. Source: Buffalo Wild Wings. Buffalo Wild Wings' 2015 performance will also be affected by price increases. CEO Sally Smith recently told investors that the company will boost its beer prices in August, followed by a targeted wing-price hike in September and a broader increase in November. All in, menu prices are expected to be 3.9% higher in the third quarter and 4.2% higher in the fourth quarter. Combine that pricing outlook with lower-than-expected chicken wing costs and surprisingly high sales growth, and you've got everything you need for powerful profit gains ahead. B-Dubs' management is forecasting $2.96 per share of earnings in the second half of 2015: up 34% over the prior-year period. And that figure would be even higher if not for the company's $160 million franchisee buyout set to close this month. Sky-high profit growth outlooks are driving the premium valuations (over 40 times earnings) that investors have assigned to Chipotle and Buffalo Wild Wings. By contrast, you could own fast food king McDonald's, with its juicy 3% dividend and 28% profit margin — but shrinking sales — at half that price. But if you're willing to pay up for a huge market opportunity, you might prefer Chipotle here. Yes, its operations are likely to suffer from more supply disruptions over time, just like the recent pork blackout. But its fast food model seems strong enough to support far more than the 1,900 restaurants -- almost exclusively located in the U.S. -- that it now operates.